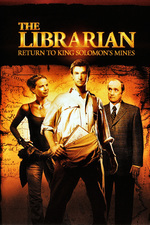 Return to King Solomon's Mines begins with Flynn's attending a party at his mother's house, where he meets up with his "Uncle" Jerry, a close friend of his late father. Soon Flynn is on a quest to locate King Solomon's Mines, and along the way he teams up with Emily Davenport, an archaeologist who helps Flynn translate the Akon (aklo algolis) language. When they meet up with Jerry in Kenya, all is not what it seems.